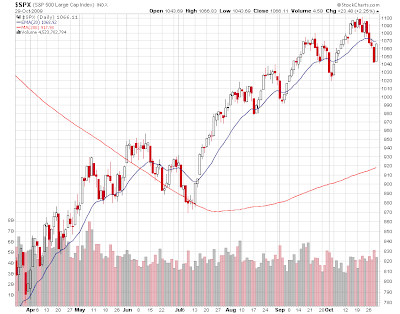 Last week I wrote a piece headed “Interim Top on S&P Signalled on Close on Wednesday”. Market activity since could be characterised as topping action. Over the week the market broke to the downside the 20-day moving average on the indices (a MAV watched by traders), and traded back beneath the previous month’s highs. In four of the last five sessions the markets closed near their lows of the day. This is a change from how the markets traded earlier in October. Over the whole of October volume has gone up in the latter part of the month (as markets traded down) compared to the earlier part of the month. Not a healthy sign for bulls. Wednesday was a short-term selling climax for stocks as volume of selling expanded. So the market was ready for a reversal day, and got one yesterday. Yesterday the Dow jumped 200 points, and the S&P500 rose by over 2% on the “end of recession” GDP release. Did this make me change my view that the markets are topping? No, because of breadth and volume yesterday. Overall volume for the big up-day was in line with the previous 10 trading days, to be more bullish needed a volume expansion. Then the breadth was not particularly constructive yesterday. What do I mean by that? Yesterday (Thursday) the volume of shares trading up was somewhat concentrated in the number of names participating to the upside. The NYSE is still the best exchange to look at for technical data for the broad market. On the NYSE yesterday advancing volume was 1.3bn shares compared to 150m shares declining, a ratio of over 8.5 to 1. However in looking at the number of issues: 2,504 issues advanced and 552 declined, a ratio of less than 1 in 5. So the reversal day was not fully in gear to the upside. A good counter-trend reversal day is useful for tactical positioning. Yesterday near the close was a good time to be locking in some gains, trimming long positions and over-writing portfolios with short call options.